Estadio Nemesio Diez officially opened on 8 August 1954, though Toluca had already been playing at the site for various years. The stadium was initially called Estadio Héctor Barraza, later Estadio Luis Gutiérrez Dosal, then Estadio Toluca 70, Estadio Toluca 70-86, and finally Estadio Nemesio Diez Riega. It often gets referred to as La Bombonera though. Estadio Nemesio Diez was one of the five playing venues of the 1970 World Cup, during which it hosted three first round group matches and the quarter-final between Italy and Mexico (4-1). Sixteen years later, in 1986, it was again a playing venue during a World Cup, but this time only hosted three first round matches. In 2016, Estadio Nemesio Diez underwent a major redevelopment in which upper tiers were built on top of the single-tiered stands and a new roof, supported by four columns in the corners, was erected. This raised capacity with 3,000 seats to 30,000. 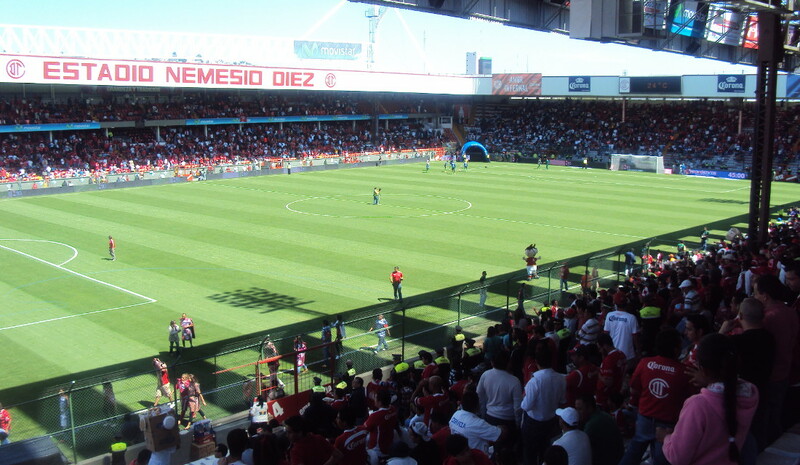 Estadio Nemesio Diez is located in central Toluca just south-west of Toluca’s city centre. The walk will take about 15 minutes. The central bus terminal, which is located toward the south-east of the city, lies further away (about 3 kilometres from the stadium). Either catch a bus toward the city centre and walk, or take a taxi. Buses from Mexico City to Toluca depart very frequently from Mexico City’s western bus terminal (Poniente) near Observatorio metro station. Tickets for Toluca games can be bought online, or at the ticket office at the stadium from a day before the match. Tickets are generally also available at the ticket windows of the stadium on the day of the match, though a few high-profile matches (e.g. America) may sell out. Tickets typically range in price from MX$ 100.00 for the uncovered sections behind the goal to MX$ 600.00 for an upper-tier seat at the main stand. Most other tickets go for between MX$ 150.00 and MX$ 300.00. Prices are significantly increased for a few high-profile matches. Deportivotolucafc.com – Official website of Toluca FC. Toluca.gob.mx – Toluca tourist information. We decided to visit a league match of Toluca vs Santos Laguna. The match got played on a Sunday at noon, which meant a rather early rise as we came from Mexico City. We first took a bus from the western bus terminal (Poniente) in the capital. There were very regular departures and the journey took about 75 minutes. At the bus station in Toluca we then caught a taxi to the stadium, which cost us MX$50 (possible somewhat too much). The taxi driver dropped us off right at the stadium after a quick ride. It was rather easy to buy a ticket. There were several ticket windows opened, hardly any queues, and some clear signs re sections and prices (though we had already done some research via the Ticketmaster site). We bought tickets for the Sombra Preferente side, which also had cover (MX$150). Seating was free and with quite a few seats with restricted view it makes sense not too arrive too late if it is a high-profile match and the stand fills up completely (which did not happen this time). The match was very enjoyable and Toluca’s fanatic fans behind the goal created quite a lively atmosphere. The atmosphere was one of the best we had seen in Mexico. After the match, it was easy to get out of the stadium. The city centre is furthermore a short walk away if you fancy eating something afterwards.